The University of Arkansas is a public land-grant, research university in Fayetteville, Arkansas. It is the flagship campus of the University of Arkansas System and the largest, best-known university in the state. Founded as Arkansas Industrial University in 1871, its present name was adopted in 1899 and classes were first held on January 22, 1872. It is noted for its strong architecture, agriculture, business, communication disorders, creative writing, history, law, and Middle Eastern studies programs. As a head football coach, Broyles compiled a record of 149–62–6. His mark of 144–58–5 in 19 seasons is the most wins and the most games of any head coach in Arkansas Razorbacks football history. With Arkansas, Broyles won seven Southwest Conference titles and his 1964 team was named a national champion by a number of selectors including the Football Writers Association of America. He was inducted into the College Football Hall of Fame in 1983. The 1964 Arkansas Razorbacks football team represented the University of Arkansas in the Southwest Conference (SWC) during the 1964 college football season. In their seventh year under head coach Frank Broyles, the Razorbacks compiled an undefeated 11–0 record, won the SWC championship, and outscored all opponents by a combined total of 231 to 64. The Razorbacks were ranked #2 in both the final AP Poll and the final UPI Coaches Poll. They were selected as national champion by Billingsley, Football Research, Football Writers Association of America, Helms, National Championship Foundation, Poling System, Sagarin, and Sagarin (ELO-Chess). 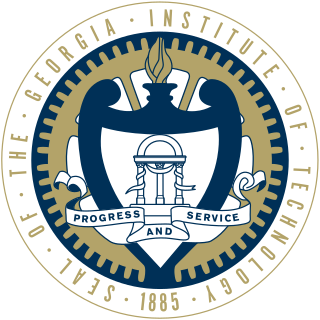 Decatur High School (DHS) is a high school in Decatur, Georgia, United States. It is the sole high school in the Decatur City School District and was established in 1912. 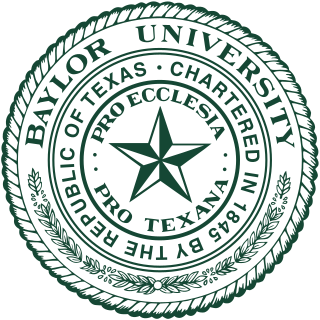 Broyles entered coaching in 1947 as an assistant coach under head coach Bob Woodruff at Baylor University. In 1950, Broyles followed Woodruff when the latter took the head coach position at the University of Florida. In 1951, he left Florida and returned to Georgia Tech as an offensive coordinator under coach Bobby Dodd. Broyles sought the head coaching position at Northwestern University in 1954,  and ultimately left Georgia Tech in 1957 when he was offered the position of head coach at the University of Missouri. Broyles stayed at Missouri only one season when he was offered the head coaching job at Arkansas. During his nineteen years as head coach there, he was offered other major coaching and leadership positions, but remained at Arkansas. George Robert Woodruff was an American college football player, coach, and sports administrator. Woodruff was a native of Georgia and an alumnus of the University of Tennessee, where he played college football. He was best known as the head coach of the Baylor University and University of Florida football teams, and later, as the athletic director at the University of Tennessee. The University of Florida is an American public land-grant, sea-grant, and space-grant research university in Gainesville, Florida. It is a senior member of the State University System of Florida. The university traces its origins to 1853 and has operated continuously on its Gainesville campus since September 1906. During his tenure at Arkansas, Broyles coached the Razorbacks to seven Southwest Conference championships, and two Cotton Bowl Classic wins. His 1964 team was proclaimed national champions by the Football Writers Association of America, as well as the Helms Foundation, and to date is the last Razorback team to go undefeated and untied in a season. If the wire service polls had not given out their national championships prior to the bowl games during that era of college football, Arkansas positively would have won both the AP and the UPI national titles as well, since Alabama (winner of both) lost to Texas (a team Arkansas beat in Austin in 1964) in the Orange Bowl. He still holds the record for most wins by a head coach in the history of Arkansas football, with 144. During the 1960s and 1970s, one of college football's most intense rivalries was between Broyles' Razorbacks and the University of Texas Longhorns under legendary coach Darrell Royal. The Football Writers Association of America (FWAA) is one of the organizations whose College Football All-America Team is recognized by the NCAA. The organization also selects the Eddie Robinson Coach of the Year, the Bronko Nagurski Trophy winner, the Outland Trophy winner, the Grantland Rice Trophy winner, a freshman All-America team, and weekly defensive player of the week, as well as developing scholarship programs and surveys for better working conditions. Since 1954, the association has awarded the Grantland Rice Trophy to the college football team they choose to be the National Champion. Among Broyles's most memorable victories while coaching the Razorbacks, was the 14-13 win over #1 Texas in 1964 in Austin, the 1965 Cotton Bowl victory over Nebraska to complete an undefeated season, the 1969 Sugar Bowl victory over Georgia, beating #2 Texas A&M in the 1975 season finale to win a share of the SWC championship, and then beating Georgia in the 1976 Cotton Bowl. The two most painful losses in his tenure at Arkansas, included the 1966 Cotton Bowl loss to LSU that snapped Arkansas' 22 game winning streak, and, most famously, the 1969 Game of the Century that saw #1 Texas come from behind to beat #2 Arkansas, 15-14. After his retirement from coaching, but concurrent with the early part of his tenure as men's athletic director at Arkansas, Broyles served as the primary color commentator for ABC Sports television coverage of college football, normally alongside top play-by-play man Keith Jackson. Broyles' time as a broadcaster at ABC lasted from 1977 to 1985. Broyles was often assigned games involving Southeastern Conference or Southwest Conference teams, but if the primary game of a particular week involved the Razorbacks, Broyles was paired with another play-by-play man, many times Al Michaels or Chris Schenkel, while Jackson called the game with another color commentator, many times Ara Parseghian. Broyles' commentary was normally focused on play calling and coaching strategy, and while paired with Jackson, resulted in an all-Georgian booth (Jackson is a native of Roopville). As a member of Augusta National Golf Club, Broyles from 1972 to 1977 co-hosted (with tournament chairmen Clifford Roberts and William Lane) the Green jacket presentation ceremony at the end of the Masters Tournament from Butler Cabin televised on CBS. In 1974 Broyles was appointed Men's Athletic Director of the University of Arkansas. (Arkansas had a completely separate women's athletics department from 1971 until the men's and women's programs were merged in 2008.) Broyles continued as head football coach for three years. Since stepping down as head coach, the University of Arkansas men's athletic programs, under his leadership as athletic director, have won 43 national championships. The Razorbacks have won 57 Southwest Conference championships and 47 Southeastern Conference championships while he has been men's athletic director. As athletic Director of Arkansas Broyles cancelled the men's swimming and diving program to satisfy new regulations from the SEC of having two more women's sports than men's sports. Over thirty of his former players have also become college or professional football coaches. Broyles is known for producing high quality coaches and the prestigious Broyles Award, the annual award for best assistant coach, is named after him. Barry Switzer, Johnny Majors, Joe Gibbs, Hayden Fry, and Jimmy Johnson all served under Broyles and have combined to win five collegiate national championships and six Super Bowls. Broyles' assistants have won more than 40 conference titles. Dallas Cowboys owner Jerry Jones played on Broyles' 1964 Championship team. Broyles' tenure as men's athletic director has seen the construction of world-class facilities for basketball, football, track and field (indoor and outdoor), golf, and baseball at Arkansas. Broyles was selected as the 20th century's most influential Arkansas sports figure. Broyles will be remembered as the only SEC athletic director that had to drop a men's sport bringing into questions the health of the athletic department under his leadership. Broyles was known as a fierce competitor both as a head coach and athletic director. Broyles led Arkansas out of the Southwest Conference and into the Southeastern Conference. 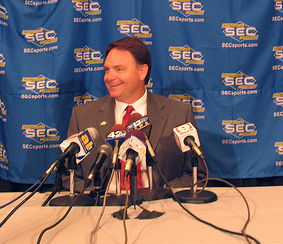 Houston Dale Nutt Jr. is a former American football coach and former player. He currently works for CBS Sports as a college football studio analyst. Previously, he served as the head football coach at Murray State University (1993–1996), Boise State University (1997), the University of Arkansas (1998–2007), and University of Mississippi (2008–2011). Nutt's all-time career winning percentage is just under 59 percent. Danny Lee Ford is a former American football player and coach. He played college football at the University of Alabama from 1967 to 1969. He served as the head football coach at Clemson University in South Carolina from 1978 to 1989 and at the University of Arkansas from 1993 to 1997, compiling a career record of 122–59–5. During his 12 seasons as head coach of the Clemson Tigers, he captured five Atlantic Coast Conference titles and won six bowl games. Ford's 1981 Clemson team completed a 12–0 season with a win in the Orange Bowl and was named the consensus national champion. Donald W. Reynolds Razorback Stadium is an American football stadium in Fayetteville, Arkansas and serves as the home field of the University of Arkansas Razorbacks football team since its opening in 1938. The stadium was formerly known as Razorback Stadium since 1941 before being renamed in 2001 in honor of Donald W. Reynolds, an American businessman and philanthropist. The playing field in the stadium is named the Frank Broyles Field, honoring former Arkansas head football coach and athletic director Frank Broyles. 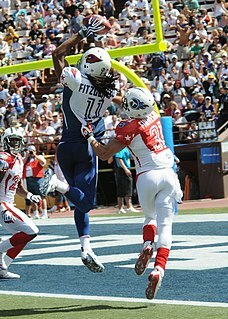 David McWilliams is a former American football player and coach. He served as the head coach at Texas Tech University in 1986 and at the University of Texas at Austin from 1987 to 1991, compiling a career college football record of 38–30. Kenneth Wahl Hatfield is a former American football player and coach. He served as the head football coach at the United States Air Force Academy (1979–1983), the University of Arkansas (1984–1989), Clemson University (1990–1993), and Rice University (1994–2005), compiling a career college football record of 168–140–4. Jack Crowe is a former American football coach. He played quarterback at West End High School in Birmingham, Alabama. He was most recently the head coach at Jacksonville State University in Alabama, a position he held from 2000 to 2012. Crowe served as the head football coach at the University of Arkansas from 1990 to 1992 season. Crowe was also the head coach at Livingston University, now known as the University of West Alabama, from 1977 to 1978. He served as offensive coordinator for head coach Pat Dye at both Wyoming and Auburn. In addition, Crowe has served as an assistant coach at the University of North Alabama, Clemson University, and Baylor University. Jack Crowe is married to Leann Crowe. 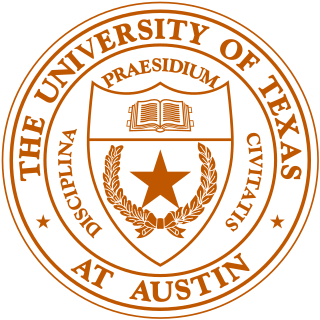 The 1969 Texas vs. Arkansas football game, sometimes referred to as the "Game of the Century", was a college football game played on December 6 in which No. 1 Texas visited No. 2 Arkansas at Razorback Stadium in Fayetteville, Arkansas. The Longhorns came back from a 14–0 deficit after three quarters to win 15–14. They won the Cotton Bowl Classic and were selected as national champions. The Arkansas–Texas A&M football rivalry is an American college football rivalry between the Arkansas Razorbacks and Texas A&M Aggies, which started in 1903. Between 1992 and 2008, the schools did not play each other when Arkansas left the Southwest Conference to join the Southeastern Conference. The rivalry was renewed as a neutral-site out-of-conference contest in 2009; in 2012 it once again became a conference rivalry when Texas A&M also joined the Southeastern Conference. Arkansas leads the series 41–31–3. The 1959 Arkansas Razorbacks football team represented the University of Arkansas in the Southwest Conference (SWC) during the 1959 college football season. In their second year under head coach Frank Broyles, the Razorbacks compiled a 9–2 record, finished in a tie with Texas for the SWC championship, and outscored all opponents by a combined total of 163 to 101. The Razorbacks' only losses came against Texas by a 13–12 score and to Mississippi by a 28–0 score. The team was ranked #9 in both the final AP Poll and the final UPI Coaches Poll and went on to defeat Georgia Tech in the 1960 Gator Bowl by a 14–7 score. Halfback Jim Mooty was selected by the Associated Press as a first-team player on the 1959 All-America Team. The 1961 Arkansas Razorbacks football team represented the University of Arkansas in the Southwest Conference (SWC) during the 1961 college football season. In their fourth year under head coach Frank Broyles, the Razorbacks compiled an 8–3 record, finished in a tie with Texas for the SWC championship, and outscored all opponents by a combined total of 183 to 97. The Razorbacks' only losses during the regular season came against Mississippi by a 16–0 score and to Texas by a 33–7 score. The team was ranked #9 in the final AP Poll and #8 in the final UPI Coaches Poll and went on to lose to the undefeated national champion Alabama Crimson Tide in the 1962 Sugar Bowl by a 10–3 score. The 1960 Arkansas Razorbacks football team represented the University of Arkansas in the Southwest Conference (SWC) during the 1960 NCAA University Division football season. In their third year under head coach Frank Broyles, the Razorbacks compiled an 8–3 record, won the SWC championship, and outscored all opponents by a combined total of 185 to 87. The Razorbacks' only losses during the regular season came against Baylor by a 28–14 score and to Mississippi by a 10–7 score. The team was ranked #7 in both the final AP Poll and the final UPI Coaches Poll and went on to lose to Duke in the 1960 Cotton Bowl Classic by a 23–14 score. The 1955 Cotton Bowl Classic was a post-season college football bowl game between the Southwest Conference champion Arkansas Razorbacks and the champions of the SEC, the Georgia Tech Yellow Jackets. Georgia Tech defeated Arkansas, 14-6, in front of 75,550 spectators. Arkansas would get their revenge in the 1960 Gator Bowl, a 14-7 Hog win. The 1960 Gator Bowl was a college football bowl game between the Southwest Conference (SWC) co-champion Arkansas Razorbacks and the Georgia Tech Yellow Jackets representing the Southeastern Conference (SEC). Arkansas defeated Georgia Tech, 14–7, in front of 45,104 spectators. There were two players named Most Valuable Player: Jim Mooty of Arkansas and Maxie Baughan of Georgia Tech. The 1991 Independence Bowl was a post-season college football bowl game between the Arkansas Razorbacks and the Georgia Bulldogs. Georgia defeated Arkansas, 24–15. 1 2 "Arkansas AD Frank Broyles will resign at end of year". USA Today. February 18, 2007. Retrieved March 22, 2007. ↑ "Frank Broyles". Hog Nation. Hog Nation. Archived from the original on October 29, 2012. Retrieved February 15, 2013. ↑ Mayer, Larry (April 25, 2013). "These Bears draft picks gained fame in other areas". Chicago Bears . Retrieved April 25, 2013. ↑ "Keeping the Faith". Northwestern. Retrieved July 20, 2007. ↑ "Alumni in the News" (PDF). The Emerald of Sigma Pi. Vol. 64 no. 1. Spring 1976. p. 5. ↑ Murphy, Austin. Not exactly Hog Heaven. Sports Illustrated , September 21, 1992. ↑ "Were We Robbed of the Razorbacks? :UA announces that more games will be played in Fayetteville". February 15, 2000. ↑ "Arkansas Responds To Inquiries". The New York Times. December 24, 2002.